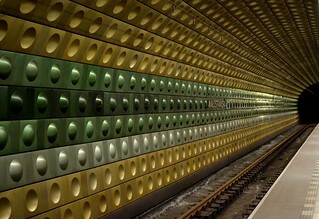 The walls were a space age green and gold, with the texture of bubble-wrap, at Malostranská Station in Prague. deathboy and I walked out of the station, dragging our suitcases behind us across the cobbled streets. In the hotel we stayed in were a number of half-tables, as if half of the table was in one room and the other half in another room entirely. Argh, Dalek bumps! I like the tv tower though. Did you ascend?